About a dozen birds later I had a nice little flock rolling around on the kitchen table. They were colourful. They were funny. And I soon discovered that they were pushy. First they demanded Santa hats. Ridiculously small Santa hats. Then ear muffs. And scarves. And just as I was considering how to make hats with ear flaps, and mitts on idiot strings they demanded an outing. Lucky for them, Mark turned up with a most surprising thing... a dozen tiny red and black sleds, perfectly sized for the birds. How he came to own these, I'm not sure. He says he originally intended them to be gift wrap decorations, each carefully painted with the word 'Rosebud'. Too clever, my husband. These proved to be quite addictive to make. Here are some step by step instructions in case you want to make some too. Just be careful - these birds have minds of their own! 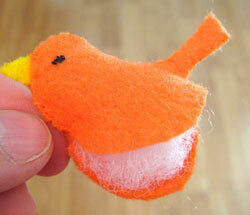 I just used felt that I had on hand - you don't need much! Cut 2 bodies and little wings, and one beak and gusset. 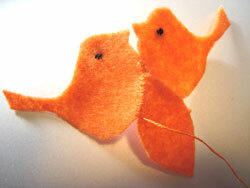 You can make the gusset wider or narrower - depending on how fat or thin you want the bird to be. In fact, these can be made into flat decorations, just by discarding the gusset. Might be nice as a gift tag? I used two strands of embroidery floss for all stitching on these, and a simple slanted overcast stitch. 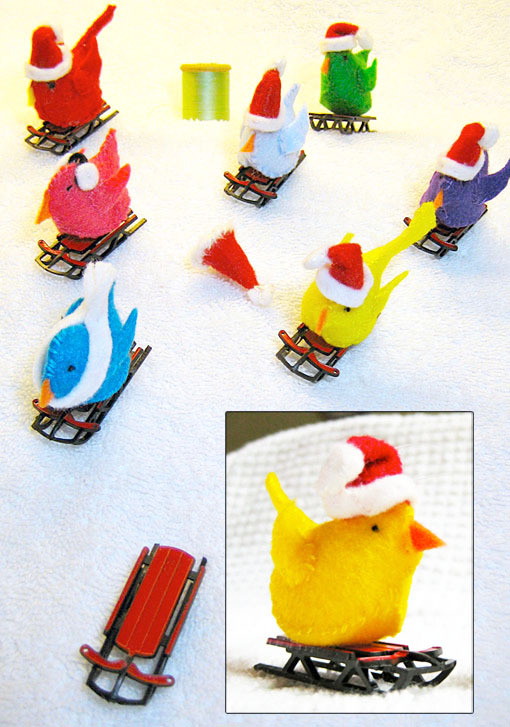 You could blanket stitch them as well, perhaps in a contrasting colour. 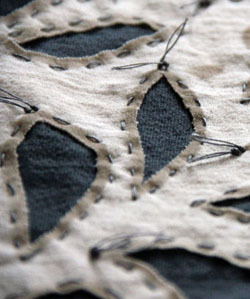 Stitch little eyes (or use a small bead) on opposite sides of the body. 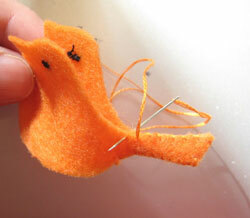 Start sewing the body sides together, just below the beak. After about one cm, attach the gusset to one side. Sew all the way around the tail, across the back to the head. 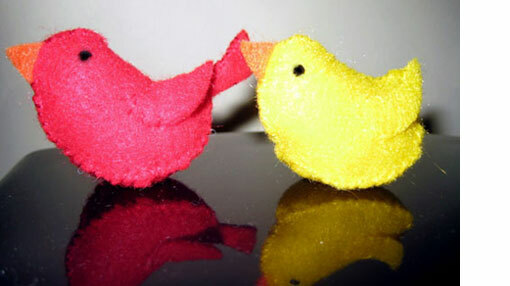 Just before you get to the beak, decide if you are going to use the separate pattern piece. If so, snip off the beak and insert the new one. I originally planned on embroidering onto the beak, and that's why it is attached to the pattern piece of the body. When I started sewing, I decided the add on beak was better, but the integral one was a great guide for where to start the gusset attachment, so I left it on the pattern piece. Sew on around and onto the second side of the gusset. Stop after about a cm to leave room for stuffing. Use a soft stuffing- not batting. Even cotton balls pulled apart would work in a pinch. 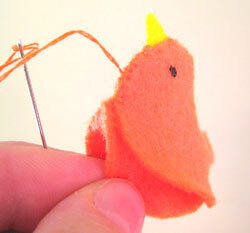 Use some pointy object to push a bit of stuffing into the start of the tail, then sew closed. Hmm, no picture for this. Oh well, you can see them on the finished birds. 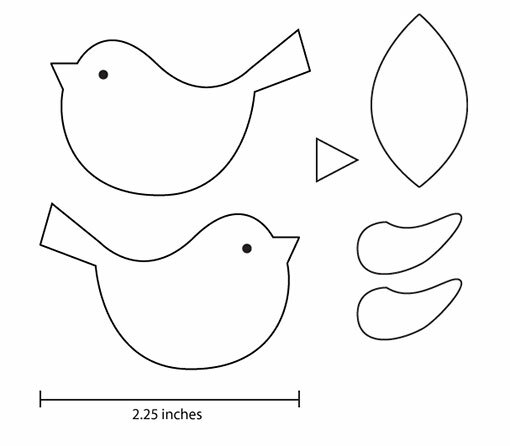 You could sew these on to the body sides before you construct the bird, but I like the chance to position them in an interesting way after the bird is stuffed. Just stitch around the rounded bit of the wing and let the rest flap free. On some I stuffed a little scrap felt into the pocket formed under the wing to give more shape. The hats were made from a quarter of a 2.25 inch circle of felt and strip of white. 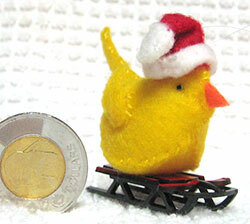 Patience required - these are tiny little things to stitch! So there you go. 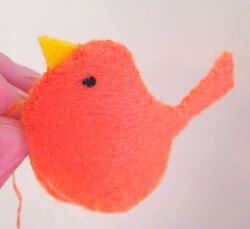 Send me a picture if you make a bird!